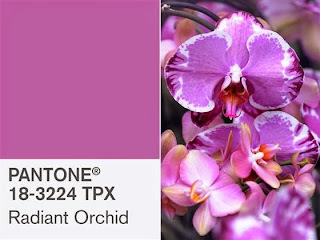 or what hues and shades are 'IN' in fashion, home decor, and design. I am FAR more interested in expressing my own personal style and preferences. I can't even begin to imagine this color in my home. or scattered in clear vases on a table for a party. It would be a temporary punctuation point of color in my pale, neutral world. a way to experiment with something new in a simple, small way that works for me. I enjoy it for a little while, then replace it with something else. I don't have to - or want to - change my whole wardrobe or decor to incorporate it. and those choices help drive the creation of new products to be manufactured and sold. I've spent a lifetime in the retail industry, and I know that this all has a purpose in the bigger picture. But when it comes down to how it affects our lives, we ultimately choose what we buy - or don't! one of my daughters gave me a sparkly, spangly purse for Christmas. Just GUESS what color it is! I turned it into a vase! get a quart of paint and revamp a chair, a lamp base, a few picture frames, or a thrifted find. How do you feel about fads? Do you heartily embrace new trends with gusto? Do you hesitate and see if it really catches on? Do you find a small way to include it in your home decor or fashion style? Or do you eschew trends altogether, and forge your own unique path?